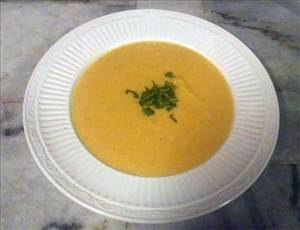 Creamy low calorie soup with a hearty taste and feel. Chop the onion, carrots, and celery and crush two cloves of garlic. Cut florets off the head of cauliflower. Start the onion, carrots and celery in the pot with a little bit of water to prevent burning. Add the salt, pepper, cayenne, turmeric, and garlic. Once the onions, carrots, and celery are starting to get soft add the chicken broth and the rest of the water then add the cauliflower. Cook the cauliflower until soft (about 20 minutes) then use an immersion blender to puree. If you don't have an immersion blender you can use a slotted spoon to put the veggies in a blender and puree that way. After you puree the mixture add shredded cheese and the milk. Let simmer for about 10 minutes then add salt and pepper to taste. This sounds great. I will try it soon. But for Atkins, I'd cook the onions/celery/carrots in butter (rather than water) and finish the soup with a heavy cream rather than milk which is high in carbs. There are 154 calories in 1 serving of Cheddar Cauliflower Soup. Calorie break-down: 48% fat, 26% carbs, 26% protein.